In the last article we learned that type 2 diabetes (T2DM) is characterized by chronic inflammation. We also learned that while inflammation often precedes the development of obesity and T2DM, obesity and T2DM contribute to inflammation – creating a vicious cycle of metabolic damage. In this article we’re going to review the complex and sometimes murky relationship between body weight and type 2 diabetes. There’s a strong association between obesity and T2DM in the scientific literature, and it doesn’t take a rocket scientist to determine that there might be a connection between the two. But some obese people never develop T2DM, and and some type 2 diabetics are extremely lean. Even more strangely, recent research suggests that obesity may actually protect certain people from developing T2DM. How do we make sense of this? Let’s find out. As I explained in the previous article, body fat isn’t just a lump of inert tissue. It’s a metabolically active endocrine organ that secretes inflammatory cytokines and hormones, both of which have profound effects on our physiology. It has long been known that T2DM is a disease of impaired glucose metabolism. But what is less commonly known is that T2DM is also characterized by impaired fat metabolism. And recent research suggests that this is one way that obesity contributes to type 2 diabetes. The first step in this process is an abnormal gain of fat mass, usually caused by overconsumption of wheat, fructose, industrial seed oils or other dietary toxins. As fat mass increases, more leptin is secreted. (Remember, leptin is the hormone that tells the brain to decrease appetite, increase metabolic rate and increase physical activity.) Chronically high levels of circulating leptin cause leptin resistance. It’s like leptin is banging on the brain’s door, but the brain has its headphones on and can’t hear leptin knocking. Leptin resistance causes free fatty acids (FFA) to spill over into tissues other than fat cells, such as the liver, pancreas and heart. This starts a chain reaction of inflammation and toxicity, because fat does not belong in these tissues and damages them when present. Also, obesity causes excessive growth of fat tissue in two ways: it makes the fat cells larger (hypertrophy) and increases their number (hyperplasia). These overgrown fat cells become unstable and eventually rupture, releasing their fat content and causing further inflammation as the body attempts to clean up the dead or dying fat cells. The end result of this “lipotoxicity” and inflammation is insulin resistance, which as you know is the defining feature of type 2 diabetes and the metabolic syndrome. At one point it was assumed that all obese people were at higher risk for developing T2DM. But in recent years, research has proven that assumption to be untrue. We now know that a subset of obese people are “metabolically healthy”, which means that their fasting glucose, triglycerides, and other metabolic markers are normal. This population, referred to as the metabolically healthy obese (MHO) are at no higher risk for type 2 diabetes or cardiovascular disease (CVD) than their metabolically healthy lean counterparts. Early studies suggested that up to 1 in 3 obese people were metabolically healthy. But these studies used either insulin resistance or the presence of metabolic syndrome (which includes 3+ risk factors) alone to determine metabolic health. But a newer study that used a stricter definition of metabolic health (the absence of any risk factor known to contribute to T2DM) found that the percentage of metabolically healthy obese is much lower: only 6%. Though the number of MHO is much lower than was once assumed, it’s still true that a small subset of obese people 1) does not develop type 2 diabetes or metabolic syndrome, and 2) is not at higher risk for cardiovascular disease. How might that be possible? The most honest answer to that question is, “we still don’t really know”. But there are a few possibilities. The first is that not all obesity is the same. There are two main areas where we store fat: under the skin (subcutaneous) and in the abdominal cavity (abdominal or visceral). Visceral fat (a.k.a. “beer gut”, “spare tire”, and “wheat belly“) is distinguished from subcutaneous fat by a large waist circumference and waist-to-hip ratio. As it turns out, the amount of visceral fat you have is far more important than body-mass index (BMI) in predicting whether you’ll develop type 2 diabetes or metabolic syndrome. Let’s take a step back and look at why obesity develops in the first place. You might be surprised to learn that obesity is actually a healthy response to high blood sugar. High blood sugar is extremely toxic. The conversion of glucose to fat is the body’s attempt to protect the liver, brain and other vital organs from glucose poisoning. But this mechanism only works for so long. Eventually the fat cells can’t accommodate any more glucose, and metabolic dysfunction sets in. Subcutaneous fat has a much larger capacity to store the converted glucose as fat, given its much larger size and distribution throughout the body. This may explain why it appears to be protective against metabolic syndrome, and why men, who possess a smaller amount of subcutaneous fat than women, tend to more easily develop “beer gut” or “wheat belly”. Visceral fat, on the other hand, is not only a smaller storage depot than subcutaneous fat, it is highly active from a metabolic point of view. It is associated with a higher production of inflammatory cytokines, and it is more susceptible to lipolysis. Visceral fat cells are also subject to sudden pressure variations (cough, physical exercise, etc.) that cause them to rupture more easily than subcutaneous fat cells. And as we saw earlier in this article, ruptured fat cells cause inflammation. All of this explains why visceral fat is an independent predictor of insulin sensitivity, impaired glucose tolerance, high blood pressure and high cholesterol and triglycerides. That means even if you have a relatively low BMI, you’re at much higher risk for T2DM and cardiovascular disease if you’ve got a lot of visceral fat. It also means that even if you have a high BMI, if you don’t have a lot of visceral fat you may not be at higher risk. A second factor in determining whether obesity protects against or causes type 2 diabetes is levels of a hormone called adiponectin. Early studies suggested that high adiponectin levels protect against obesity, and it was observed that adiponectin levels were inversely correlated with BMI. 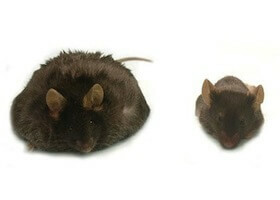 But later studies found that increased levels of adiponectin in mice led to remarkable weight gain – that wasn’t accompanied by high blood sugar or other metabolic abnormalities. In fact, the mice with high adiponectin levels are up to 5 times fatter than the control mice, but they still don’t develop type 2 diabetes. This suggests there may be something about adiponectin that protects against the metabolic abnormalities that cause T2DM, and that adiponectin levels may be another explanation for why some obese people don’t develop diabetes. A third explanation for the MHO phenotype may be genetics. I’m going to leave it at that for now, because this article is already getting very long, and I’ll be writing more on the contribution of genetics to diabesity and metabolic syndrome. As we saw above, the MHO are not at higher risk of developing type 2 diabetes or heart disease. However, there’s more to health than normal triglycerides and blood sugar. A group of researchers recently found that the MHO who don’t have T2DM and CVD die at the same rate as those that do. The MHO are at higher risk for cancer and death from any cause than the non-obese, and they are also at higher risk for dying from traumatic injuries. This highlights the negative impact of excess weight alone. What’s more, weight loss still improves insulin sensitivity and fasting insulin levels in obese people that are metabolically healthy. Although nearly 1 in 3 Americans are obese today, it hasn’t always been this way. Overweight and obesity have only become common in the last 40 years in the U.S., and is virtually unheard of in traditional hunter-gatherer societies. Leanness is the natural human state, and obesity is a sign that something has gone wrong. That’s why I think it’s still a good idea for the overweight and obese to lose weight, provided they do it in a responsible way that doesn’t include severe caloric restriction (which won’t work in the long-term anyways, and can actually predispose towards increased weight gain in the future). Given the non-metabolic problems that characterize obesity – such as impaired mobility, joint problems, reduces sexual function, psychological and social status, etc. – all obese individuals will benefit from losing weight. In part 2 we’re going to discuss the mirror reflection of the metabolically healthy obese phenotype: the “metabolically unhealthy non-obese”, a.k.a. the “skinny diabetic”. Intermittent fasting (IF) can lead to weight loss, an improved metabolism, and a lower risk of chronic disease. Find out why IF works—and when it’s a good choice for your health. RHR: What’s the Best Diet for Diabetes? Disclaimer, I’m not a doctor, nor have studied anything related to medicine, this is simply an idea that has been circling in my mind from what I’ve read on the web. And when every solution fails, diabetes symptoms start? Now I bet that the degree to which each persons dna is encoded to use “the solutions” varies. Some might simply skip storing it as fat, others could have an unlimited fat storage (and they go tremendously fat, but without diabetes). What do you think? Nice article. I am glad to see an explanation of diabetes beyond just a weight issue. I have type I diabetes, diagnosed at age 5. I weigh 108 lbs. I stay active, physically fit. My parents were both thin and participated in sports and physical activity. They encouraged and participated in physical sports with us kids, for which, I am grateful. I work out three times per week, and, despite, having had diabetes for 45 years, have no sign of complications. My father developed type II diabetes, and he was thin. The public needs to understand that it is not just a weight issue. Diabetes, both type I and type II, as well as other types, has very complex causal factors. Thank you for your article. The obese individuals who did not develop Type 2 Diabetes in the additional weight was due to one logical premise. They are not insulin resistant or insulin resistant enough to trigger T2D. Type 2 Diabetes is just the physiological expression of end stage insulin resistance. Please see research article – UCLA Dr. Tracy Mann research on dieting (don’t remember the details, but if you google that info, it will come up). Given that 95% or higher percent of people who lose weight gain it all back within a couple years – 5 years at the most, and given that 2/3 of those who lose and regain actually gain more weight than they lost, how can we keep advocating weight loss as a remedy? There has to be something else, because it doesn’t work! And the dieting measures themselves sometimes are hazardous. Clearly there has to be another answer. I’m just tired of “lose some weight” being the answer to everything! Weight/fat storage is regulated by insulin in concert with other hormones. Weight loss is an indicator of more efficient insulin action. So weight loss isn’t a cure; rather, it is evidence of a possible reduction in insulin resistance for Type 2s. Doctors need to quit calling it a solution and let pattends know that their goal is to increase insulin sensetivity. Two ways to do that are through diet and exercise. A third way is medication. Medication isn’t proving remarkably successful for many people. Also, doctors typically recommend a little as 10 lbs. weight loss. The problem is that when people hit that or any other weight loss goil they stop being vigilant about their diets. Diet ends, old patterns return, weight loss is reversed with extra gain because the body hasn’t yet become more efficient at using insulin. I wonder if doctors use that 10 lbs as a seemingly achievable benchmark but fail to explain to their patients that the manner of the weight loss will play significantly in reversing seemingly intractable diabetes symptoms. Exercise is important. Diet, however, is key. Someone who is glucose intolerant will have to continually adjust his or her diet to eliminate as much added sugar, starch, and reduce other carbohydrates (especially grain-based). Harvard Medical reports that MORE than 30% of ALL overweight people DO have diabetes! And, that the majority of the remaining percentage can and will have an increased incidence of developing diabetes over time BECAUSE of excessive body weight. They also report that MORE THAN 80% of all people with diabetes ARE overweight! It’s unfortunate when a medical school like Harvard actively opts out of evidence-based medicine in favor of patient profiling. Sadly, it’s happened many times throughout history. The Nazis measured people’s skulls to determine intelligence. We’d like to believe we’ve advanced. A sober look at the weight loss/obesity money making machine indicates otherwise. What you describe, is typically labeled as yoyo dieting. It is not some phenomenon. And it is usually not healthy. The problem that I see with many overweight individuals, is that they are uneducated regarding not only proper nutrition, but proper portion sizes and proper DAILY physical fitness requirements. Absent any metabolic deficiencies requiring medical procedures or hormone therapies, everyone can lose body fat. Many people will go on some “DIET” for a short period of time in an attempt to correct years of excessive consumption and inadequate levels physical activity. After this “short period” they go right back to the levels of physical activity and eating the same foods in the same quantities that caused them to gain weight in the first place. And they are bewildered as to why the weight returned. There is no mystery. If they return to the lifestyles that resulted in their becoming overweight in the first place, they will naturally continue to be overweight. They MUST adopt a new healthier lifestyle that they can continue forever. NOT, diet and exercise for a few weeks or months then return to their old ways. They MUST substitute healthier food choices for practically every meal, snack and beverage. They MUST decrease their portion sizes to smaller nutrient rich amounts. They MUST progressively add 20 -30 MORE minutes of bone density (weight training) and cardiovascular exercises into their daily routines, each and every day. They MUST reduce their stress (long walks, yoga, meditation, swimming, ETC). And, they must do these things for the rest of their lives. Forget what your scale says. Improve your health each day and the weight will gradually return to a healthy level. It took years to gain the weight. If you are one of those people who claims that it is impossible to lose any weight, stop eating all food for the next week (not healthy at all) and then please tell us how much weight you gained? YES! This is 100% true, well actually 90% true. The part about fasting not being healthy at the end is not true. In fact it is the best way reverse and eliminate insulin resistance. Never seen and obese or overweight person ever that ate healthy foods or portions. Ever. It’s time people accept responsibility and wake up. Start caring about yourself. Isn’t your health more important than some temporary discomfort in making dietary changes? Nobody seems to be able to tell me how I have Type 2 Diabetes I’m 76 years of age, no family history, no sweet tooth I’m thin I have always exercised every time at the end of a 2 mile walk I walk up 170 concrete steps to my house plus a steep hill, I do this 4 days a week minimum on days I don’t do this walk I do other exercise. I’m always full of energy, I did have a quad bypass in 2010 and since then up until I was told I had type @ diabetes I took Statins!!!! Anyway my problem now is that I was 160lbs when told I had diabetes 9 months ago and since have gone down to 140lbs and I don’t like being this thin the trouble is that if I increase my food intake so as to put on a bit of weight my glucose reading shoots up so does that mean I have to stay at this low weight for evermore. Demand a GAD and IA2 antibody screening for auto-immune diabetes or MODY. Yout might not be producing sufficient insulin. A common side effect of statins is that they cause diabetes. This is why my Mom is concerned about taking them after her heart attack. So I definitely wouldn’t consider you as evidence of thin people getting type 2 diabetes since you are on drugs. Sorry this happened to you. I hope you have gotten well. Figure out how to get off the drugs. This site is a good start. Google Jason Fung as well for diabetes advice. Question. What about obese people around 350 lbs. that are diagnosed with partial leptin deficiency (about 12 nanograms of circulating leptin) do to lose weight when their bodies think they are starving? Their metabolic rate is low, they are geared to crave bad food and have increase hunger. Over time, this individual hit middle age and began to have pre-diabetic symptoms. Oddly enough, this individual is somewhat active for her size and didn’t eat any (and often less) than her thin husband. She never drank sodas, juice, or even coffee with sugar in it. What can she do to lose weight? She really needs Leptin injections but they are not available. Suggestions? What is her overall consumption of breads, pasta, and other types of carbohydrates? She may not be up on sweets, but savory carbs can be just as bad. I was diagnosed with type 2 diabetes about 10 years ago by my doctor, iwas about 10 ilos overweight hardly Obese, since then i have lost a lot of weight. I am 1.7 m tall and only 66 kilos, why do i still have insulin resistance and diabetes. i have problems with high stress and anxiety which started about 1 year before i was diagnosed because of some personal finance probelms whereby my stress levels went through the roof. Before that time i was very healthy. Do yo have any idea how you can help me would be very helpful because i am very worried about it. Hi! I’m a new diabetic FBG was 8.7 HA1C also elavated. Trying diet control 1st but my meter levels are all over the place!! Range from 3.1 – 9.7 with and without food and not eating any sugar! Also I am a tiny person! I loose weight daily if I don’t eat enough. I had symptoms but now not so noticeable. More tired,dizzy.. Also ferretin is chronic low of 6-4 heamaglobin is normal could I be so used to having high sugar now with no sugar, I feel so bad? How can I level out my BS to feel Normal again???? Help! Have you had a GAD test or c-peptide? You might (not a doc, but am a late onset T1) have LADA or another variant of T1. Fruits have fiber, after all. Lindberg upped the fructose content in his paleolithic clinical trials by fruits with no adverse metabolic effect. Perhaps HDL might drop though ? Some fruits have high fiber…some decidedly don’t. Also, a lot of fruit servings are consumed in juices (esp. apple, orange). Squeeze one orange and see how much juice releases (approx. 1/4 c or 2 oz.). Compare that to the “traditional” serving size of orange juice–back in “the day” 6oz, and lately as much as 8oz. Not hard to see how we can overload our systems with fructose. Well, they do have a 5% chance. 😉 Honestly, my hope is that you can go on to prove your diet works and keeps weight off, then publish how to do it and make scads of money, because then I will have hope. Until then though, I’m not going to try another diet that will result in weight gain. I just have too much to lose, pardon the pun. I’m not just talking about myself. I’m talking about the patients I treat and the many, many readers who’ve written in with success stories. I get between 3-5 emails a day with reports like this. There are many non-dietary causes of weight gain, and limiting factors to weight loss. I’ll be writing more about those in the future. It sounds like perhaps you’ve had a difficult time losing weight. I’m sorry to hear that. But that doesn’t mean that weight loss is a hopeless endeavor for everyone else. Far from it. What do you think about the argument out there that obesity might possibly be a symptom rather than a cause of T2DM or metabolic syndrome? You’ve proven that it works for you. Which is great. In those studies there are 5% of people who lose weight and keep it off, not 50%. Let’s say it was only 50% though… that means a 50% chance of losing weight and a 50% chance of getting even fatter. Not the best odds. I am very glad that you’ve found a way of eating that works for you. So which method will allow for successful weight loss? Since you say weight loss is possible, I’m assuming you can point to a peer-reviewed study that shows some method successfully allows people to get down to a “normal” weight and keep the pounds off for at least 5 years. I’ve been searching for such a study, and can’t find one. I really hope you’ve found one, because otherwise telling fat people to lose weight is like telling a short person to get taller. Show me a study that uses the methods I’m advising people to use (paleo-type diet, high-intensity strength-training, thyroid normalization, anti-inflammatory detox, stress management) and I’ll show you a study where people lose weight and keep it off. Also, keep in mind that there ARE people who lose weight and keep it off in those studies – but there are an equal number who don’t. That’s not the same thing as saying “telling fat people to lose weight is like telling a short person to get taller.” Not even remotely. I haven’t been able to find full text. If you are interested and manage to get it from somewhere I’d love to read it. I’ll be writing an article about the connection between the gut microbiota and diabesity soon. I don’t have access to the full-text of this particular study, but I’ve seen others like it. It does not have to be inflammation that drives the disease progress. Lack of things related “anti-inflammatory system” can make the difference too. I think it’s much more crucial than all of these pro-inflammatory stuff. Loss of tolerance is the key. In conclusion I’d suggest that activation of innate immunity in adipose tissue could cause leptin resistance through SOCS-3. I don’t disagree that inflammation plays a role. In fact, I just wrote an entire article about that a few days ago. However, although it’s true that insulin surges don’t cause diabetes, it’s still true that chronically elevated insulin levels do. That’s just basic hormone physiology. There are also studies of both lean and obese diabetics that don’t have elevated levels of inflammatory markers, so inflammation isn’t always the primary causative agent. These conditions are complex and multifactorial. Thanks, Chris, I see what you’re saying. Even constant potato eaters would only have surges after meals, not high insulin levels all day every day without other contributing factors, so that makes sense. But if leptin works the same way, how does someone who is already leptin resistant AND obese (and presumably producing chronically high leptin levels) break out of that cycle? When levels of the hormone drop, sensitivity will improve; but how do you get the levels to drop in the first place when leptin resistance and inflammation from overloaded fat cells are causing your hypothalamus to say, “Supersize those fries!”? If that’s still coming in your series, I’m looking forward to it. Chronically high insulin levels do cause insulin resistance. Insulin surges (from natural carbohydrates) in the absence of inflammation, lipotoxicity and genetic factors do not. It is possible to restore insulin sensitivity to varying degrees. Our body is a dynamic and adaptable system. In the presence of too much of a hormone, the cells downregulate receptor site expression to avoid overload. When levels of that hormone drop, the cells increase receptor site expression (which improves sensitivity). The same is true for leptin. Do we know this to be true? I ask because low-carbers used to think that high insulin levels alone (from high-carb eating) caused insulin resistance, but healthy and trim high-starch societies seem to prove that wrong, and I think we know now that something else has to get the insulin resistance started, like the chain of events that you describe involving inflammation. I think that’s an important question because, if high leptin levels cause leptin resistance by themselves, then people who are already obese would seem to be stuck. Even if they eliminate all other unhealthy factors, their obesity will keep leptin high, keeping leptin resistance up, keeping leptin high, etc. The only way out would be liposuction — actually removing fat cells to cut leptin production (I’m just guessing that would do it) — or a drug that blocks leptin production (if one exists). But if other factors (like gluten or PUFAs) cause the leptin resistance, there’s hope of breaking the cycle. Plagiarizing Paul of PerfectHealthDiet: a leaky gut, caused by a bad diet (consumption of grains and fructose+omega 6 in excess), could lead to more pathogenic infections and thus increasing inflammation and diabetes incidence? There seens to be a connection between diabetes and some infections (Pubmed 11417300, 20632447, 20508853, for some examples). On this line of thinking, Pubmed 20415859 seems to be an interesting article! Too bad it’s not open access. Mario: yes, there’s definitely a connection there. As I’ve been arguing in this series, T2DM is an autoimmune, inflammatory disease involving a pathological expression of innate immunity. This is characteristic of other Th1-dominant autoimmune diseases, like Crohn’s and Hashimoto’s. We know that infection can trigger those conditions, and of course some believe that they are caused by an unidentified, persistent chronic infection. They hygiene hypothesis has been advanced as a possible explanation for autoimmune disease, and pig whipworm (which provokes an immune response) therapy has been used successfully to treat Crohn’s, ulcerative colitis and some autoimmune allergy conditions. When you say “fructose” do you mean fruits too? or are you meaning the fructose adding in other products? Yes, I also mean fruits. A small amount of fructose from fruit (say from 2 servings per day) is okay, but beyond that fructose begins to be harmful. Thank you for your comment on fruit. I think the over emphasis on fruit in the diet is a mistake. One reason is that fruit juices are seen as healthy, but they are too easy to guzzle and are lacking any fiber which would slow their metabolism. Thanks for your advices. I guess I should take in account my vitamin D levels and my thyroid functions too. Would taking inflammation reducing supplements like Zyflamend and/or a Tumeric extract (curcumin) help in weight loss? I have an interesting story relating to these in how they might have helped me carpal tunnel syndrome and as a side effect kick started my initial 50 pound drop in weight. In 2007 I was 100 pounds overweight. I started an overnight job working in a freezer. This drastic change forced me to intermittent fast daily as I wasn’t hungry at night and slept through the day. I also started eating lower carb although not strictly. I wasn’t trying to diet at the time I just started eating that way because of circumstance. 3 months went by and I lost about 10 pounds. Then I developed carpal tunnel (cold environment, repetitive motion) and decided to try a natural regimen first. I’m glad I did. Within a month of using Zyflamend and a separate Curcumin extract the carpal tunnel went away. Well, so did the fat. As in about 50 more pounds seemed to disappear in the next month. People thought that I was sick it went away so fast. I was definitely in a ketogenic state as I had no cravings whatsoever for anything and had to force myself to eat once a day. I had incredible energy and felt the strongest I had ever felt in my life. Full disclosure: I’m sure the 4 cups of coffee (no sugar) had something to do with it as well…but what do you think about the anti-inflammatory supplements? Yes, anti-inflammatory supplement can help. I do a weight loss program with my patients that is based on a 3-week elimination diet and anti-inflammatory cleanse. It’s remarkably effective. Very interesting. I am eagerly waiting for the second part and hope to find out more about my condition. I am a skinny 5’6″ 134 lb male with impaired glucose handling. Despite not eating simple sugars, white rice and soda, I have ended up with a condition where my 2HPP glucose levels over between 180-200. I have given up wheat (but do eat some barley – is it bad?) completely, eat lots of fish and eggs. I sure hope to make better sense of my health with your next installment. In short: eliminate wheat and dramatically reduce fructose and omega-6 fat consumption, eat fatty fish with high levels of omega-3 a few times a week, normalize your vitamin D levels, address any thyroid issues (if present), manage stress and restore adrenal function. Interesting article, especially on the MHO issue. I never thought obesity as a healthy response to high blood sugar. I agree with you that leanness is our natural state and being obese is unnatural and unhealthy. I have some spare tire myself from years of eating lots of bad stuff like wheat, sugar and vegetable oil. Is going low carb the best way to reduce my visceral fat?